So, last month I told you guys that my word for the year was “receive.” It sounds simple, harmless really, but for me this little word holds a lot of meaning. Sitting around the table eating dinner with my church family, I told a few of my sisters what my word was and they responded with a collective “Oooohhhh….” Why? Because they know. Because they know me and they know that I have trouble receiving. It makes me uncomfortable. It makes me squirm. I feel self-conscious and self-indulgent. The reason I have trouble receiving is because I have trouble asking. And the reason I have trouble asking is because I don’t always believe God is a good Father who wants to give good gifts. And the reason I doubt the love of the Father is because my earthly father(s) are not perfect. But, I’m choosing to believe God these days. I’m choosing to literally say out loud “Father, I believe you love me. I believe you are a good dad, who delights in giving to His children.” It’s become a mantra, a daily anthem cry of my heart. So now as I am believing, God wants me to start asking because I cannot complain or grumble for what I do not have, if I have not asked of the Father. This is the verse I am leaning into and making my daily bread. Everyone who asks receives, it says. A promise. So, I’m asking, in order to receive. I’m submitting to God my spiritual wish list, if you will. That my ears be tuned more and more to the Holy Spirit. That my mind be transformed to that of Christ. That the power of God be made manifest in my life. That my heart cling to the things of God. That holiness be my preservation. That my children grow in the ways of the Lord and love Him wholly and completely. That my marriage continue to be protected, intimate, full of love and grace. That my desire to publicly speak to others about freedom be realized, on a grander scale. That my family comes to know and trust Jesus. That my church family grow in unity, humility, and be of one mind and one accord regarding each other as more important than ourselves. That Jesus remain Head, forever and ever. Amen. What do you need to ask God for today? What have you yet to receive because you have yet to ask? You know, the Father likes to give us fish instead of snakes and eggs instead of stones. My problem is that I ask for too many snakes and stones. Fortunately, He doesn’t give me what I want. What I want is to ask for what He wants me to have. Yes. Hopefully we never come to a place where God doesn’t surprise us. He loves to surpass our expectations. I so understand and I empathize. I think in the last couple of years, am I finally getting to a place where I don’t ask for the snake. Where self-sabotage isn’t common and where I really listen to what God has for me. It’s liberating and I’m praying the same for you friend. Amen! Thank you for sharing your heart! I know many woman, including me, who can relate to this! I also know that I am lacking closeness to God. I don’t know exactly what’s wrong with me in that department, but it’s almost like apathy, and I don’t like it. I’m asking God to renew my passion for Him. Oh friend, I prayed for the same type of friend for years. Literally years, and He answered my prayers. Remain steadfast and full of faith believing that He has that for you. God values friendship and I believe, desires it for us, in deep and meaningful ways. Praying too for your distance from the Lord to be broken and for a new fire to begin glowing. Thank you Nicole. It’s oddly comforting to know that you also waited years for an answer (and got one). It hurt so much when I thought that God had brought me a wonderful friend, and then she was ripped away from me in unpleasant circumstances. We still keep in touch, but it’s not the same as having a friend “in the flesh,” who I can talk with face to face — and we were only starting to get to know each other well. Thank you again for the prayers. I need them, and it’s been difficult to pray for myself lately. I would share my own wish list with you here, but everything that I am asking for is exactly what you have shared on your list. Thank you, friend. I think you just prophesied to me on behalf of the Father. My heart is full. It’s such a balance, isn’t it? I mean, I want to be quick to invite the Lord into the everyday things–dishes, laundry, broke down cars, but I also want to elevate Him to His rightful place as King. Because when I do that, He naturally comes into the little things. When I’m focused on His face, He takes care of the rest. And, so you know (and just to remind you) God is NEVER sick of you asking. This is AWESOME. 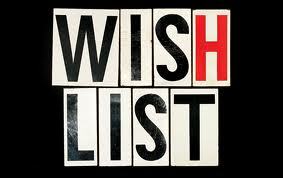 Every year, God gives me a word and I write up a spiritual wish list just like this one. I love your heart in this and Im so glad another sister is doing this too. SO good. He’s such a good Dad. Thank you, sister! He is a good dad indeed. I have just been reading about asking God things too in my study of the book of James. We’re in chapter one where God asks us to ask him — here for wisdom– but his answer is wonderful. “To God who gives generously to all without finding fault.” Ahh, those are soothing to me. Generously, without finding fault. I like that. One of my favorite Psalms, 81:10 “I, the LORD, am your God, Who brought you up from the land of Egypt; Open your mouth wide and I will fill it.” He faults Israel for not asking of Him what He longed to give them or do for them. We tend to limit God. We can also deprive others of the blessing He would give them when we do not allow them to bless us. I suppose this is the inverse of the “bless me” teaching. Hi Nicole! Your post reminded me of being told in a meeting that if anyone had a complaint, only complain to the one who can solve the problem. This can also be applied to our spiritual lives. You have inspired me to make my own wishlist and then see what happens. I forgot to ask what it means to have holiness be your preservation? Is it that we do not have because we do not ask, or that we do not have because we do not believe? *winks* Perhaps you can come up with an answer for that one, sister. I think asking is very much believing. But, that doesn’t stop me from crying out “I do believe, but help me overcome my unbelief!” either. Oh, and it’s good to have you back around these parts.